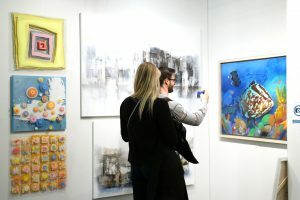 Artexpo New York, the world’s largest fine art marketplace and longest running contemporary art show, celebrated its 40th Anniversary in formidable style from April 19—22 at Pier 94 in the heart of Midtown Manhattan. 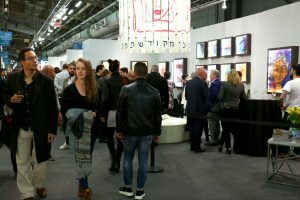 This year’s show reported record trade attendance, together with a five percent increase in ticket sales over last year’s event, reinforcing its popularity as one of the country’s most electrifying art expositions. 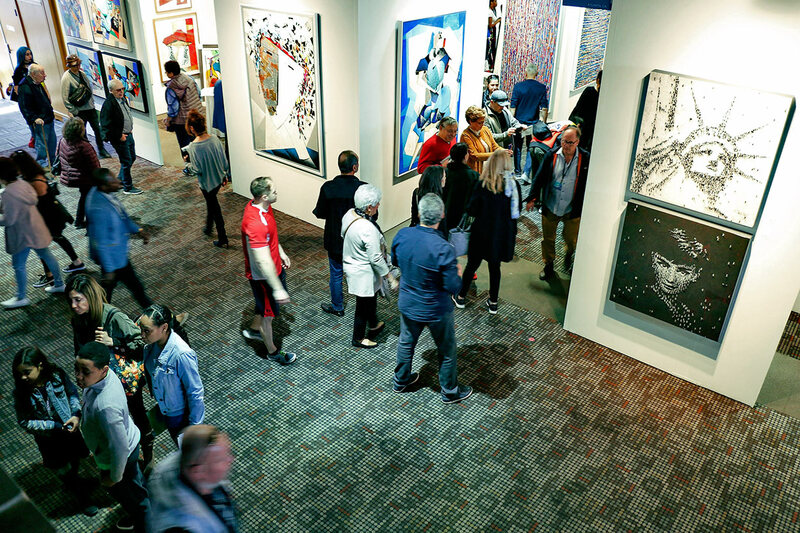 To celebrate 40 years of excellence in art, Artexpo New York presented [MAGNIFY] as the curatorial theme for 2018–examining four decades of artistic expression through a retrospective lens. 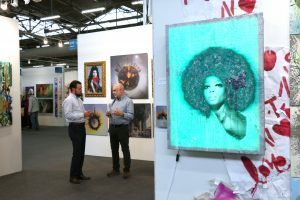 Thousands of enthusiasts, together with the art world’s international trade and industry leaders, flocked to experience the annual fine art destination and its Three Shows Within One Venue, including [SOLO] and [FOTO SOLO]. 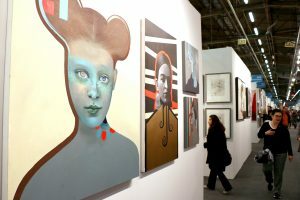 Artexpo New York XL hosted more than 400 innovative exhibiting artists, galleries and publishers from more than 40 countries across the globe, showcasing original artwork, prints, paintings, drawings, sculptures, photography, ceramics, giclee, lithographs and glass works among other contemporary and fine art. 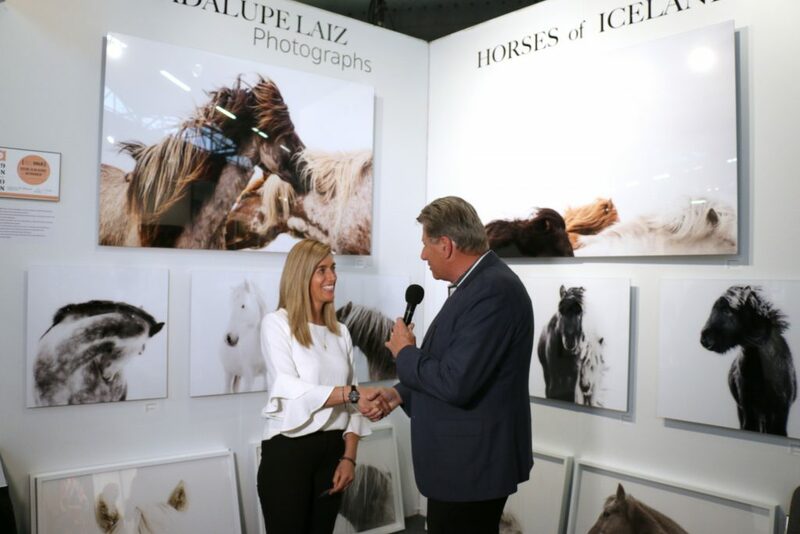 Artexpo New York 2018 delivered the largest international gathering of qualified trade buyers—including gallery owners and managers, art dealers, interior designers, architects, corporate art buyers, publishers and art and framing retailers—all of whom returned to enjoy the series of education seminars, cocktail parties, live entertainment and other special events. 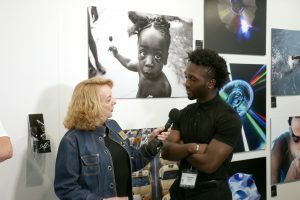 This year’s featured Art Lab installation, located in the [SOLO] exhibition area, was a special presentation created by notable visual artist, Jon Henry–a photographer and alumni of the New York Film Academy. Stranger Fruit showcased a thought-provoking collection of images evoking the artist’s reflection on the black family and community. 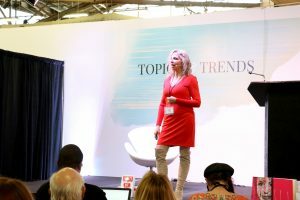 This year’s comprehensive Topics & Trends Education Program included an extensive series of 20+ seminars, moderated panel discussions and lectures, hosted by a group of handpicked leaders from various genres of the arts industry, presented on the show’s main Education Pavilion. Subjects included Nuts And Bolts Of Copyright and Trademark Law, Getty Images: The Art & the Business, through to Making The Internet Work For You. 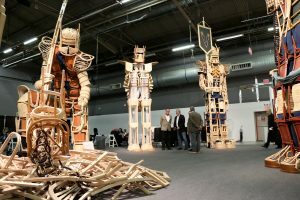 The very popular Rising Artist Gallery, showcased more than 40 emerging artists of tomorrow, and the unique Sculpture Garden, proved a popular addition to Artexpo New York XL, containing individual works by the leaders in this field, including Victory by Stephen Farland of Chairborne Arts, who presented an immense warrior-like depiction of life emerging from rubble–constructed entirely out of recycled wooden chairs from Poland. 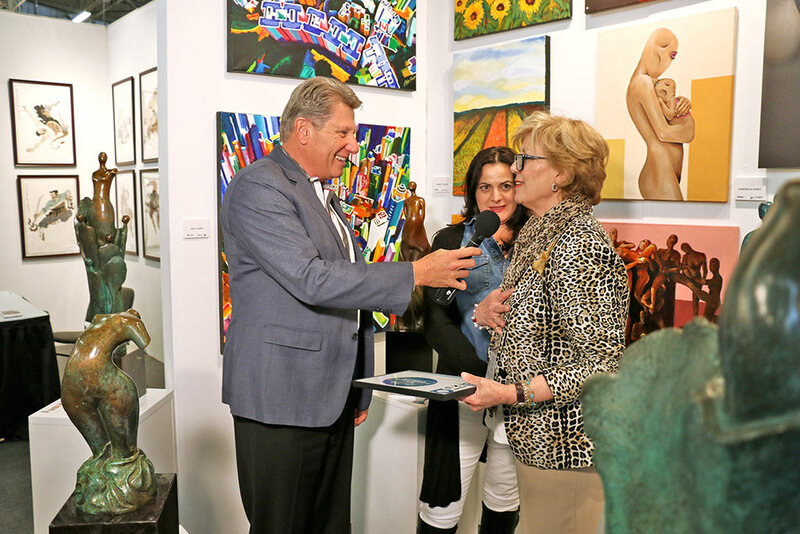 This year’s show saw fashion royalty, with a rare appearance by the renowned designer, Carolina Herrera, who was welcomed with her husband by President and CEO of Redwood Media Group, Eric Smith, before walking the exhibition floor and honoring her invitation by the owner of South Florida Arts. On Friday, April 20th, Art Brand Studios presented the unveiling of Light Of Hope to benefit The Alzheimer’s Foundation Of America. Acclaimed artist Blend Cota announced a collaboration to benefit the foundation, whereby a unique painting was revealed in his singular style, known as Colorism, depicting the Empire State Building. All proceeds from Light of Hope benefited AFA and its mission to deliver compassionate care to patients and support to caregivers. 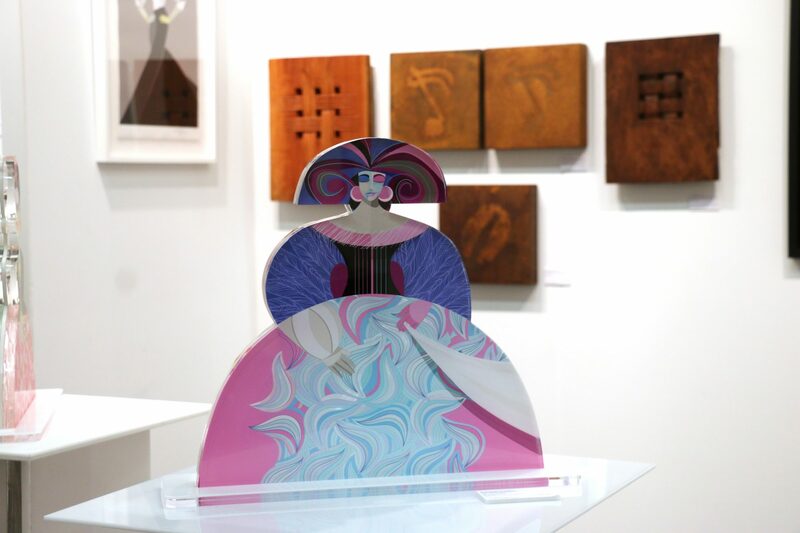 Chae, Rim from Korea placed several of her metallic landscape sculptures, including Prana and Spring In My Hometown, totaling sales in excess of $60,000. 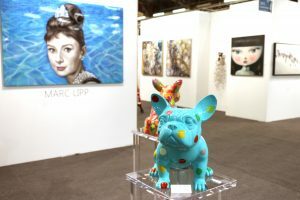 Able Fine Art Gallery placed five pieces, including Jean Nak and JJ Marino, totaling sales of $25,000. JBIS Contemporaty and artist Jeffrey Basillon, placed five pieces including Adidas Sneakers and Dollar Sign, totaling sales of more than $25,000. Metallo Gallery and artist Cassidy Watt placed 24 of his unique Remnant Totems, totaling sales of more than $10,000. Aneela Fazal placed a total of 11 pieces, totaling sales of more than $25,000. 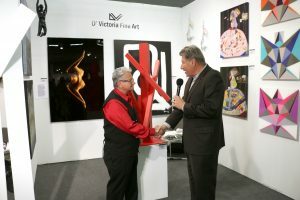 DATG Concept placed more than five pieces, with sales exceeding $50,000. LIGHTS, CAMERA, ACTION! THE MEDIA BUZZED! 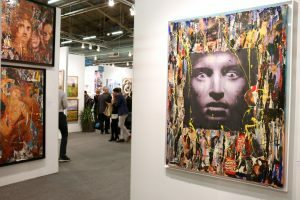 The 40th Anniversary Celebration of Artexpo New York captured the attention of major media outlets in New York and beyond, with coverage including onsite coverage by CBS, a shout-out in IN New York, the full story about the show in Art World News, a call-out as one of the top reasons to visit New York in the Robb Report, and many others. We also reached more than 100,000 fans via social media, offering followers around the world up-to-the-minute event tidbits and photos on Facebook, Twitter, and Instagram. Thanks to everyone liking and following us on our social media channels—we love keeping you engaged! And last but not least be sure to check out all the video highlights from this year’s show here. 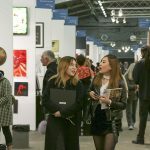 Whether you see Artexpo New York as the place to grow your business or the place to be discovered, your exhibition will definitely give galleries, trade buyers, and art collectors from all over the world the chance to see what you can do. 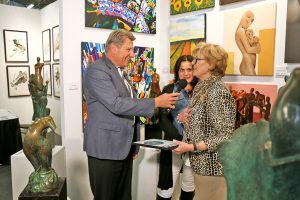 Returning to Artexpo after exhibiting this year or inspired by this year’s event and want to give exhibiting a shot yourself? Don’t wait to apply as prime space is already filling up. Apply for 2019 here—or contact our Sales team—we’re here to help you. 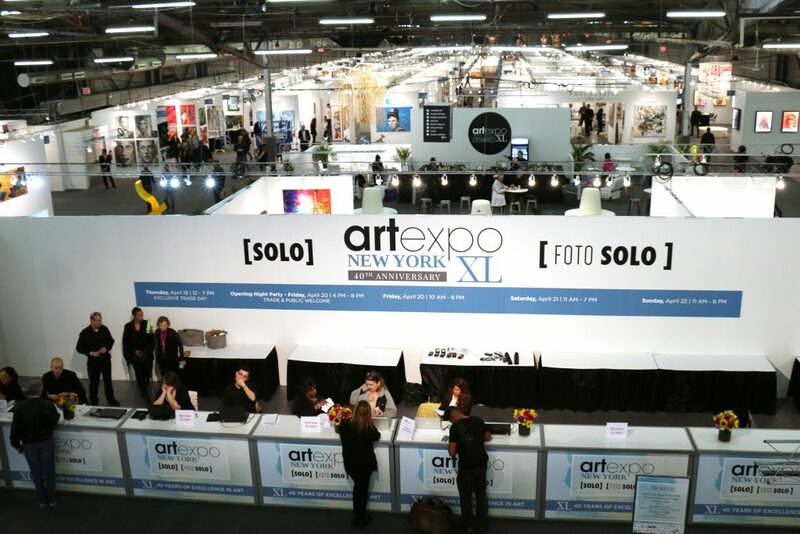 We would like to extend a huge thank you to the countless exhibitors, collectors, galleries, and artists who played a part in Artexpo New York 2018. We would also like to thank our sponsors for making this year’s event one of the best. We are looking forward to seeing you again next year as we begin the fifth decade of Artexpo New York!